Fr Richard Gibbons, PP and Rector of Knock Shrine, Joe Kennedy, chairman, Ireland West Airport Knock, and Joe Gilmore, managing director, Ireland West Airport Knock, at the announcement of the chartered New York to Knock pilgrimage flight. Photo: Henry Wills. Parish priest and rector at Knock Shrine, Fr Richard Gibbons, says the historic announcement of a chartered Aer Lingus flight to carry pilgrims from New York to Knock next August is the first step towards marketing the shrine as a major pilgrim destination to tens of millions of Catholics in the USA. The announcement that Aer Lingus has come on board to operate the first official chartered US pilgrimage was widely welcomed last week. 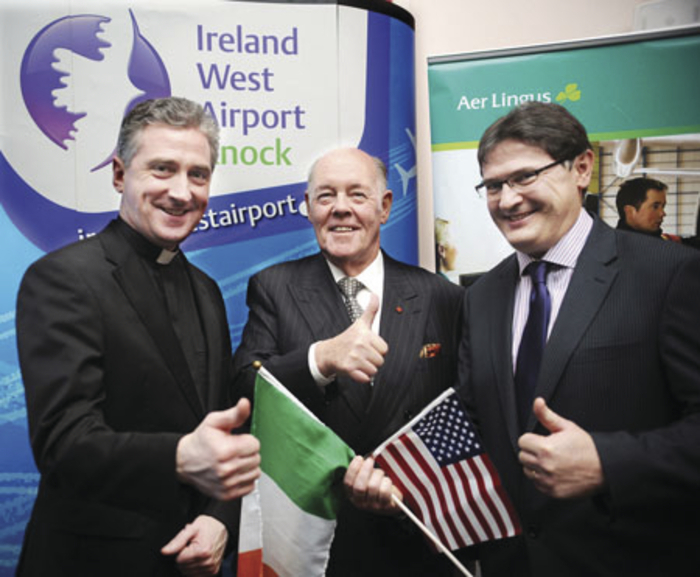 The special pilgrimage flight, which will arrive to Ireland West Airport Knock on August 9, is the first transatlantic service operated by Aer Lingus between the US and IWAK and the first official chartered pilgrimage from the US to the National Marian Shrine. IWAK chairperson Joe Kennedy described the development as a “dream come true” and said he is hoping the move represents “an important stepping stone in securing regular transatlantic services for the region into the future”. For Fr Gibbons, the announcement has been two years in the planning and is part of a much grander ambition not only to ensure Knock Shrine retains its special place in the hearts of Irish Catholics for many years to come, but to put the religious site on the map internationally as well. In 2013, Fr Gibbons announced a wide ranging programme of modernisation at the shrine. As part of that plan, the Basilica, built in 1976, is currently undergoing a major refurbishment, which should be 70 to 80 per cent complete for the 2015 pilgrimage season and fully complete early next year. New faith programmes have been introduced to tell a new generation of Catholics the special story of that wet and rainy night on August 21, 1879, when a group of ordinary people witnessed something extraordinary. A new focus on marketing Knock at home and abroad is also part of the plan and the chartered pilgrimage from the US is part of this campaign. “We recently set up a specific office dedicated to marketing and communications, looking at how we can better promote Knock,” said Fr Gibbons. “This [New York pilgrimage] is a very important and historic step for the promotion of Knock at home and aboard,” he explained. “It is hugely significant that the Archdiocese of New York, led by Cardinal Timothy Dolan, is deepening its relationship with Knock Shrine and highlighting the spiritual heritage of Irish Amercians, especially in New York. “It is also important to note that Ireland West Airport Knock was built specifically to welcome pilgrims to Knock Shrine as well as to develop the economic life of the west. Monsignor James Horan, I'm sure, would be very proud," he added. Fr Gibbons said there was no reason to think the August pilgrimage would not be the beginning of something very special. “There is nothing firmed up with Aer Lingus but our hopes are that that’s what will happen,” he added. Page generated in 0.1535 seconds.